One Huge Expanse of Aetherspace. 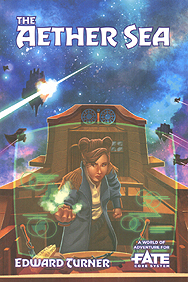 Manoeuvre your ship through the vast aether in The Aether Sea, a Fate world and adventure by Ed Turner. A thousand years of war on Homeworld left it a magically blighted wasteland, so the elves and dwarves stopped fighting for five minutes and figured out how to leave it behind. Soon everyone took to the vast, empty aether sea. The Royal Hegemony keeps a tight rein on the Spellcasters' Union and the magic that makes aether travel possible. Play the crew of a little aethercraft out in the deep sea. But you've got bad blood with the Royals, so take jobs carefully and make do with the best magic unofficial channels can provide. Keeping the ship afloat won't be easy. The sea's a dark and lonely place, and second-hand magic is... fussy. When it works at all. New species rules using Fate Accelerated style approaches. Ideas for aethercraft, including aspects, combat, and manoeuvring through space. A full starter adventure: It's Only an Elven Moon. Batten down the Hatches and get ready for liftoff!